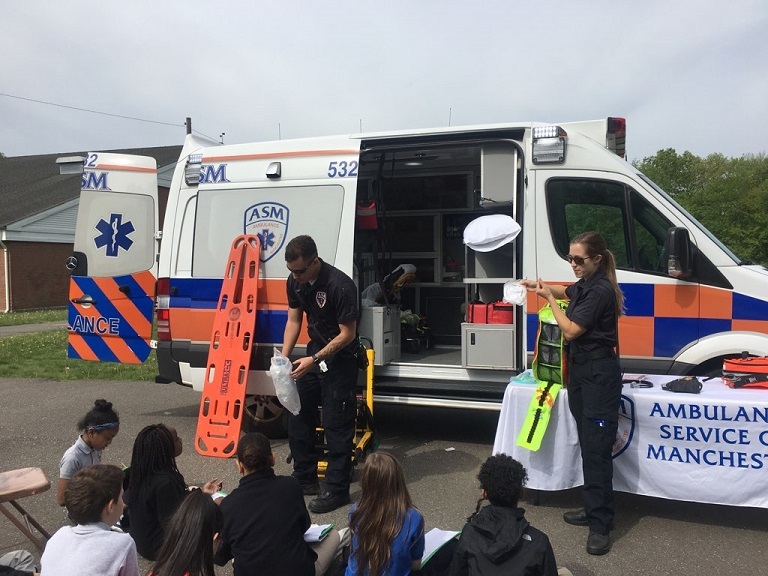 MANCHESTER-On Friday May 18, Ambulance Service of Manchester EMTs, Orlando Diaz and Karisa Welch visited Pitkin Elementary for a Career Day. 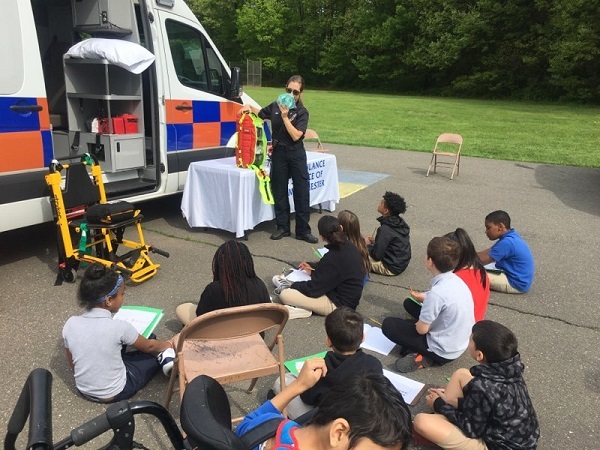 Groups of students ranging from first-graders to sixth-graders had the opportunity to learn more about the EMT profession in an engaging way. 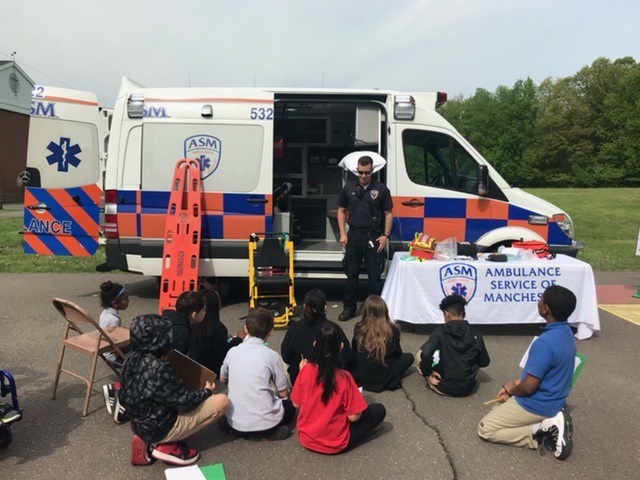 The day featured demonstrations of popular medical equipment and a tour of one of our ambulances. 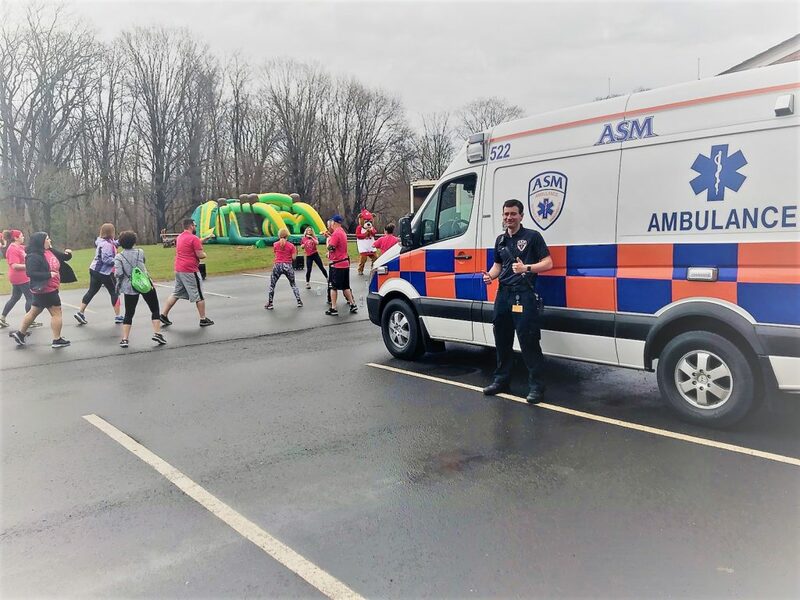 MANCHESTER- On Thursday May 4th, 2017 the Ambulance Service of Manchester participated in Manchester Health Department’s “Life is a Picnic” Senior Health Fair. Over 40 organizations took part in this event offering services and demonstrations to hundreds of seniors within the community. ASM’s Kyle Caldwell and Karisa Welch spent the afternoon fielding questions and interacting with participants like long time Senior Center Volunteer Earl Parent, featured in the picture above. 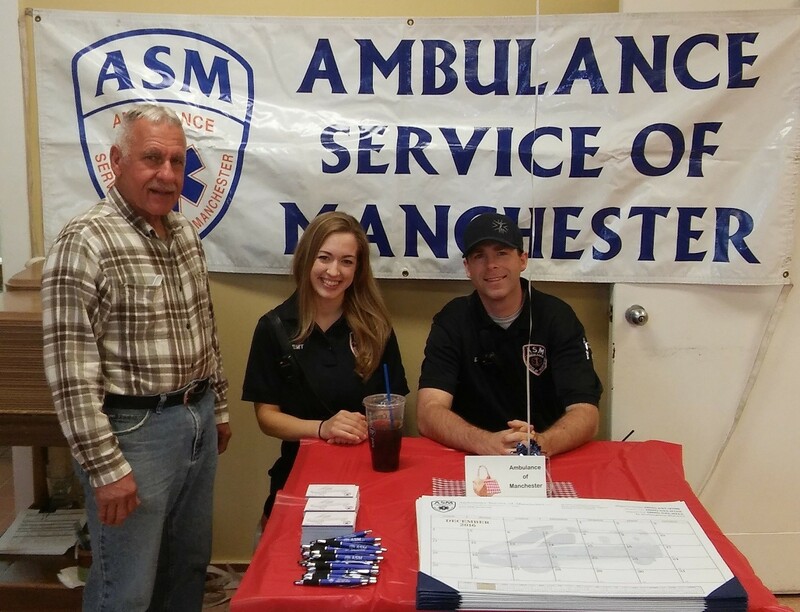 MANCHESTER — On June 7, 2016 seven EMTs were added to the ASM team. As part of our continued growth Aetna and ASM seek out only the best candidates. We look for employees who are focused on high-quality patient care, are team oriented and conduct themselves in a professional manner. During the orientation, employees learn about company philosophy and goals, quality assurance, and policies and procedures. Benjamin Adamik: FULL TIME, EMT. My name is Benjamin Adamik and I’m 22 years old. I currently live in Manchester where I was born and raised. As a recent graduate from the Medical Laboratory Science program at the University of Vermont, I look forward to a career in medicine. In my experiences as an EMT, I have found emergency medicine to be extremely captivating, and is where I see myself contributing within healthcare. I ultimately plan to apply to Physician Assistant programs with the goal of working in an Emergency Department. During my time at college, I was involved in tumor suppression therapy research, took a medical service trip to Lima, Peru, volunteered on a local ambulance service, and had the opportunity to ski some of Vermont’s finest peaks. In my free time I also enjoy hiking, fishing, swimming, and overall being outside. I have a strong sense of adventure and am always looking to gain new experiences. I believe our experiences are fundamental for who we are as individuals, and therefore to grow and improve ourselves we must seek out the unfamiliar. Altogether I am very grateful for the opportunity to be a part of the Ambulance Service of Manchester, and for the experiences I will be granted as I learn and grow as a healthcare provider. Michael Cedeno: FULL TIME, EMT. My name is Michael Cedeno I am 27 years old and I currently live in Hartford, CT. I’ve worked at Manchester Memorial Hospital for about five years. I started off in the kitchen as their Cook and Event Caterer then worked my way to the emergency department doing Patient Access. During my time working in the ED I’ve seen quite a few interesting things that intrigued me to want to learn more about patient care and all that health providers do to help save and improve the quality of life for their patients. I enjoy helping and caring for people so I took my EMT course last fall and I’m glad to have been given an opportunity to help serve and care for the people of the community that are in need and rely on EMS. Justin Cole: FULL TIME, EMT. My name is Justin Cole. I am 31 years old. I was born, and raised in Illinois and moved to New England in July of 2012. I currently reside in South Windsor, CT. The majority of my life I have had an interest in the medical field especially since I grew up with family members working in hospitals and as nurses. I am an avid outdoorsman and was looking to combine my love for climbing and my health care interests together. In the summer of 2015 I took a Wilderness First Responder class with plans to start a career in outdoor guiding as a single pitch rock climbing instructor. However, after the first responder class my interest in emergency medicine became more important to me. 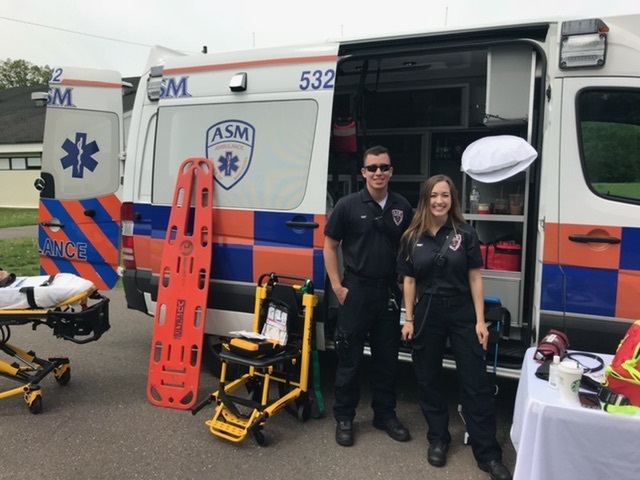 Following the summer, I signed up for an EMT class in the Fall of 2015 in South Windsor and after starting class I immediately fell in love with it and have developed a passion for emergency medicine. After finishing my EMT class, and earning my certifications I have become a volunteer for the Bloomfield Volunteer Ambulance Service. I am very excited for the opportunity to be a part of the ASM family and grow as an EMT. I am also looking forward to joining such an amazing team of health care providers and serve my community. Scott Harrington: FULL TIME, EMT. My name is Scott Harrington I am 29 years old and currently live in Agawam, MA. I graduated from Western New England College in 2009 with a degree in psychology. After I graduated I spent six and a half years as a police dispatcher with two different departments in Massachusetts. 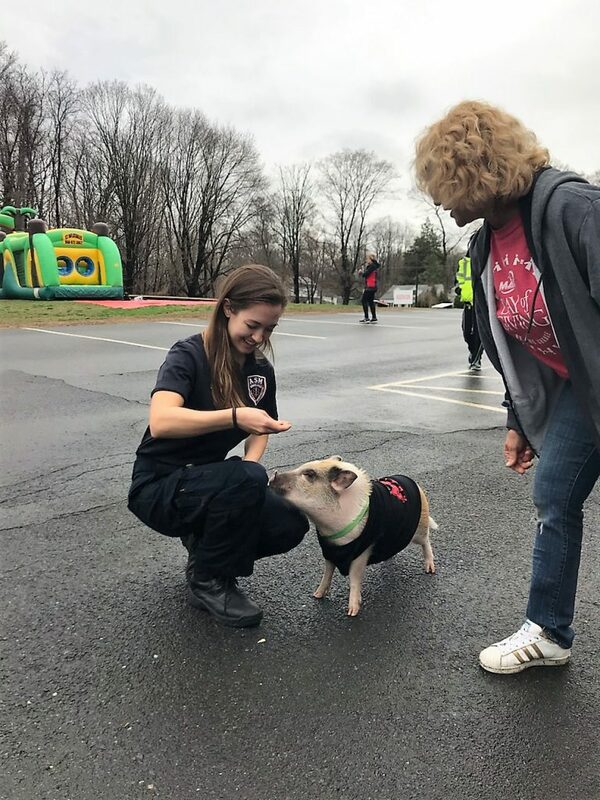 I first obtained my EMT certification in 2007 and I finally joined the EMS community in the fall of 2014 when I began to volunteer as an EMT with Suffield EMS. Soon after I started with Suffield I realized I had found a new career path. I am looking forward to learn and contribute as much as I can to ASM and the communities we serve. I am also going to be attending paramedic school this fall at Greenfield Community College. In my free time I enjoy spending time with my fiance, kayaking and target shooting. Sean McNeff: FULL TIME, EMT. My name is Sean McNeff and I am a 24 year old from Enfield. I graduated from Central Connecticut State University (class of 2013) with a Bachelor’s degree in Biology. I worked a couple jobs in retail and insurance, but decided my desire was to work in medical field/emergency services. I recently completed EMT class at Asnuntuck Community College and got certification shortly after. I hope to one day become a paramedic and remain in EMS. I am happy to finally find a career I am excited for, and couldn’t be happier for the opportunity to begin that career at ASM. 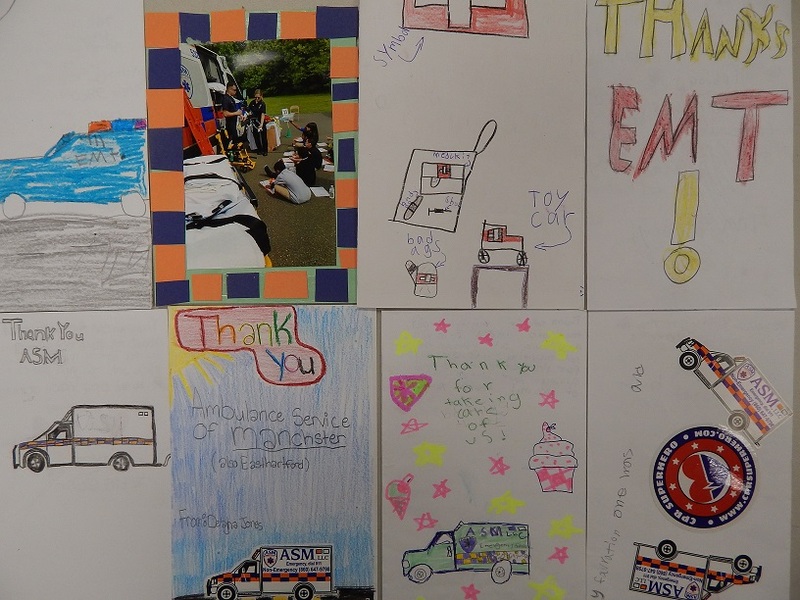 Erind Muco: FULL TIME, EMT. My name is Erind Muco and I am 22 years old. I was born in Tirana, Albania and moved to the U.S. when I was six years old. I currently live in Wethersfield, CT. I recently graduated from UConn with a B.S. in Biological Sciences and now I hope to attend medical school. At ASM, I am looking to gain invaluable medical experience which will propel me further in my medical career. When given the opportunity, I enjoy traveling and learning about different cultures, as well as watching/playing soccer, football, and basketball. I am proud to be a part of such a distinguished company, and I am excited to begin working. Karisa Welch: FULL TIME, EMT. Full time, EMT. My name is Karisa Welch. I am 21 years old and from Somers, Connecticut. I recently graduated from UConn with a Bachelor of Science in Allied Health and a minor in Psychology. During my time at UConn I was dedicated to serving the community through my leadership roles in Public Health House and my honor society. My experience volunteering in the ER at Johnson Memorial first peaked my interest in health care. I explored this field more by shadowing a Physical Therapist and a Physician Assistant. This helped me discover that my ultimate goal is to become a Physician Assistant. I currently volunteer with Somers Fire Department. I am very excited to get this valuable experience in emergency care as an EMT. I’m looking forward to learning new things and helping people each day! 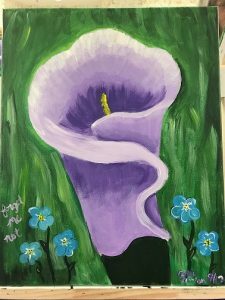 ASM Office Staff Participate in Alzheimer’s Fundraiser!